Sometimes there are things that fall in place and make a happy accident. 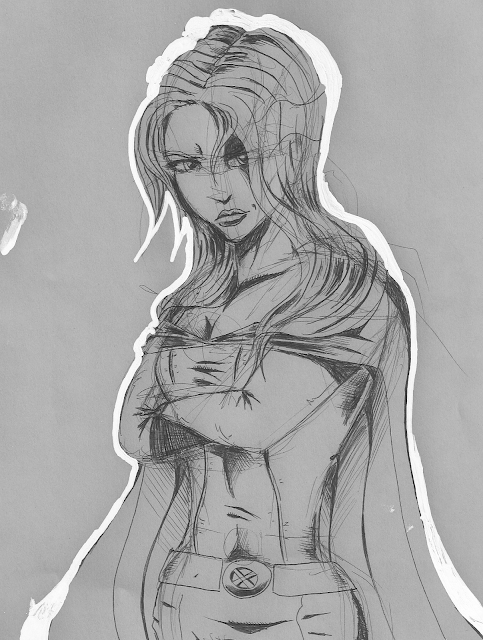 I drew this picture of Emma Frost of the X-Men and I made a mistake. While on a technical level, I really liked the way her body looked, the shadows on her, her hair, and the folds of her costume, I realized that I made a blooper. I made Emma's head a touch too big, which made her look like a little kid. Fortunately, I thought that I could hide the bigness by putting White-Out over part of her head, effectively shrinking it. However, when I scanned the picture into my computer, the paper gave it a unique look. And even more, the White-Out made Emma's head really pop. So I put a White-Out outline around her whole body to maker her entire figure jump out. It makes the picture look really unique. The other thing that helped was because the paper that I drew this on is actually blue. But when I scanned the picture, I didn't realize that my scanner would pick up on the saturated look of the paper. But that turned out to really different and fun looking. Yes, I love it when you get a nice surprise that you did not expect.